n/a Norse and/or Icelandic. Leppa appears to mean "fox". 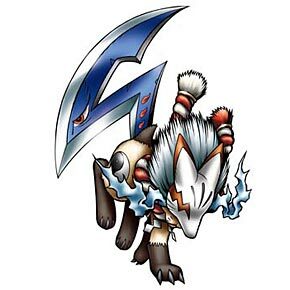 Gabumon + OX "This masked fox cuts the wicked with his enormous tail blade!" Digimon with the power of "sky" and "proud" have +400 attack power. When your opponent has more than 60 points, you may take a card from their Dark Area and place it on their Point Gauge. Kurukuru Rekkuzan means Whirling Air Slice, Juugarangeki means Beast Fang Random Attack.